From the moment Gutey and the boys drafted three wide receivers in successive rounds of the 2018 draft, I knew it was going to be trouble. The Packers had accumulated too many players at the same position. Worse yet, as mid- to late-round picks, they were not bad, but maybe not good enough to be more than a backup. It was clear that the Packers were going to keep all three draftees around for at least a year, which meant the roster was going to be thin at some other positions. Because Green Bay has so many receivers of roughly equal ability, and still uncertain potential, the team has some difficult decisions to make in 2019. The sooner they decide who to keep and who to drop the better. We’ll put Davante Adams in the keeper column, but who else? Marquez Valdes-Scantling and Equanimeous St. Brown are neck and neck – both flashed ability and performed above expectations as rookies. They’ll undoubtedly going to be given another year to see which one – or possibly both – emerges as a bona fide starter. Given that they are big-bodied and very fast, I’m confident both will have solid NFL careers somewhere. Do the Packers have the time to develop them, and do they have the roster space? I suspect the highest of the draftees, fourth-rounder J’Mon Moore, will stay on through training camp, but he’ll have to show marked improvement if he’s to make the final roster. His minimal lack of playing time last season indicates the coaching staff was unpleasantly surprised by what they saw of him. 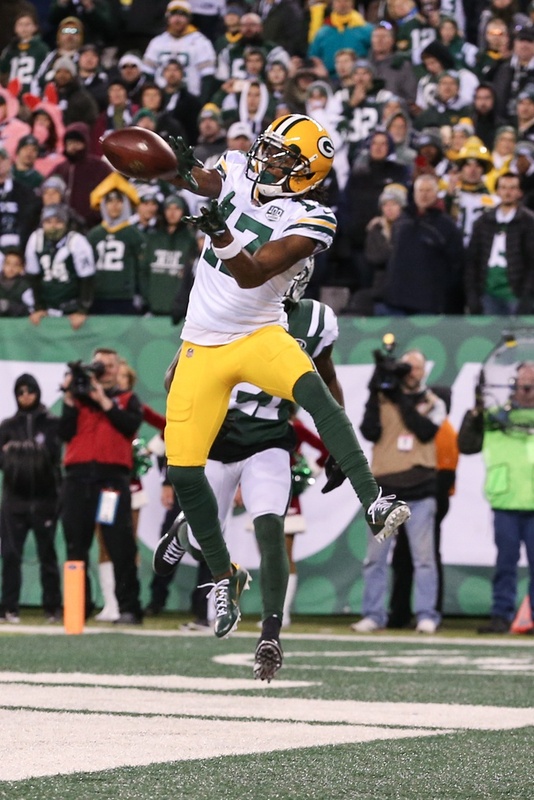 There were some mixed signals regarding Geronimo Allison, who I spoke of in early February [Link: Will Geronimo Get a New Contract, or Be the Odd Man Out? (2/5)] Off to a fine start last season, Geronimo got a concussion in week four, and was later placed on Injured Reserve after undergoing groin surgery. As a restricted free agent, he was only given an “original round tender,” which still allowed other teams to make offers that the Pack could then match. [Link: Packers News: Jake Ryan Leaving for the Jaguars, Geronimo Allison Signs One-Year Contract, Adrian Amos to be 31 (3/17)] Days later, though, the Packers secured him, though pretty cheaply ($2.025 million), and only for a year. Not a great vote of confidence by the front office. Still, one of the WR jobs is his to lose (pending the draft). I think we can write off Trevor Davis. Given the excess of receiver candidates, he’s used up his allotted draft and develop time. Jake Kumerow, like Max McCaffrey before him, is intriguing – and enough so that he too will probably be picked off if he’s placed on the practice squad. He needs a very solid pre-season if he’s to cement a spot on the 53-man roster. Time is running out on the 27-year-old. Allen Lazard is 6’5” and 227 – as if we needed another large WR with potential. He finished up at Iowa State in 2017 holding most of the school’s receiving records, and he was named to a couple of All-Big 12 teams. After going undrafted and spending much of the 2018 on the Jaguars’ practice squad, Lazard was picked up by the Packers in December. Since they were already stocked with big receivers, someone must see something to like in Lazard. He does lack the speed (4.55) of MVS and EQ, but he was a beast in college. No one is talking about free agent Randall Cobb lately. If no other team is interested in him, could he still be part of this conversation – at a bargain basement price? Who else would be a capable slot receiver? Green Bay doesn’t have the luxury of waiting to the end of preseason to determine how much talent these young guys possess. That’s because most observers are convinced Green Bay will be drafting another wide receiver in one of the first three rounds: at overall selection 12, 30, 44, or 76. In contrast, Moore was taken with pick 133, MVS at 174, and EQ at 207. Green Bay’s confidence in how fast and well their existing receivers will develop should dictate if, and which one, of those four picks will be used for a WR. That assessment needs to be made by draft day, April 25. Given this surplus of WR’s, it would be great if they could trade one or two away, but only VMS and EQ have displayed enough potential for that to happen. What this all goes to show is that Green Bay would have been wiser to draft one high-potential receiver than to load up on developmental prospects for such a critical position on a team led by Aaron Rodgers. GM Gutekunst, however, would probably respond that last season the best player available when the team’s late-round picks came up kept being a wide receiver. Doubling the challenge, at tight end we have the same damn situation: one obvious starter, and three borderline or unproven backups. I’ll get into that at another time, but the Packers are already four-deep there: Jimmy Graham, Lance Kendricks, Marcedes Lewis, and Robert Tonyan, Jr. As with the WR’s, a host of experts feel that another of those first four picks will be used for another tight end. Usually it take 3 years for receivers to fully blossom into NFL caliber. It wouldn’t be advantages to give up, even if they aren’t exactly what they could be. Also, with LeFluer wanting to run the ball more, this may ease the pressure and open things up for the receivers so they don’t have to be all world in their second year. I’m not sure when everyone started with this “instant gratification” attitude, but I think it’s time everyone starts being a little bit more realistic. Ain’t nobody got time for 3 year developments my man. The definition of “win now” apparently consist of relying on your drafts each year to “bring it home”. Coupled with strong signings in free agency, much like you’ve seen the last two years. I’m not sure what i was thinking, i always thought a “win now mode” meant you were a player or two away. I thought a “win now mode” meant you actually had a chance, because your team wasn’t dysfunctional and you had the talent already on the team through good player acquisitions. It appears i have a lot to learn. As for the obvious starter at TE, I would argue that the stats for the fourth string TE are pretty comparable to that of the so called first string TE. Based off of pay, sure, there’s an obvious starter. Based off of production? I’d say they’re all one in the same. If we draft some WR’s this year we might be lucky if they develop by the time Rodgers decides to retire. Yeah…only First Round WRs are good NFL starters. Apologies to A. Brown (6th) and Packers all time leader Donald Driver (7th). Packers only have 3 TEs under contract and all 3 will not be under contract next year at this time. Time to reload. I expect the Pack drafts a TE early and another late. Except for the tight end that will be under contract. Wait, did Lance Kendricks get resigned? Bill MIcheals said the Packers didn’t resign Kendricks. Meaning…Graham is signed on for another two seasons (this and next). I understand giving Jimmy 18 million before his second season, just makes it seem like he’s played longer. You got to get up pretty early to put one over on Russ Ball. Year 2 is the precise year most teams know what they have in a wideout. Other than randy moss I can’t think of a top notch wideout in the last 20 years who was immediately a game changer. The only thing i can assume with this team is that they are in no danger of being in the Super Bowl. Well instead of getting on me for pointing out a common theme in football you could have saved your negative comments for the information released today indicating russ ball “cap guru” fucked up hard and the packers are right against the cap now. Apparently miscalculated. Well ain’t that a kick in the teeth. And all this time i was “assuming” Russ Ball was doing an outstanding job with our Packers. Another learning experience for me. Good player but didnt have that kind of impact… to be fair I dont think anyone has. Who of the three rookies will be best? I say St. Brown. Lazard is an animal. At Iowa State he was the first down man, gained more yards then the whole offense. He kept that team in every game to the end. Puts some pounds on him he’ll be a fantastic tight end. Most do not consider special teams when looking at roster. If the team keeps a 5th or 6th receiver they need to be able to contribute on special teams. In many cases that means kick off returner and punt returner. Who is that player(s)? Unless the team is going to have DBs return kicks and punts like last year, a receiver or two must step up or a receiver will need to be added, draft or otherwise who can return punts and kicks without dropping the ball. The team can’t have Williams returning punts. Alexander and Jackson were no better handling the ball plus the DBs can’t keep healthy playing defense, let alone returning kicks. Even though Davis has showed nothing as a receiver he might still make the team as a returner. Just stop fielding punts at the 1 yard line or less. I think the team drafts a returner type receiver in the middle to late rounds with returner duties in mind. It is a concern having rookies return punts when the weather gets bad, but it is probably better than using a DB. If the team is going to improve they need to do so in all three phases of the game. While I think at least 2 of the 3 of St Brown, Moore and Vandez-Scandling will improve next year, it may not appear in the stats because this offense will likely pass much less than it did under Mike McCarthy. Rodgers had nearly 600 passing attempts last year and when he’s healthy he usually has had 550-600 passing attempts. Last year, LaFleur had his quarterbacks throwing only about 430 attempts. This is one of several reasons why I think Rodgers may not buy into this offense. Well le fleur had a less talented qb who was getting absolutely crushed due to atrocious offensive line play. They had to run a lot in Tennessee. Kyle Shanahan, Sean McVay, all these guys run a lot of play action. It’s the basis of their “modern” offense. You have to run a lot in order for play action to work. Stiggy is absolutely correct about LeFleur’s offense in Tenn. last season. They had some injuries and were forced to run. Out of top 10 most rushing attempt teams last year only 2 did not make the playoffs. The Bills and the Titans. The Packers ranked 32nd in rushing attempts. The Patriots ranked 3rd. Out of the top 10 most passing attempts last year only 3 of those teams made the playoffs. The Colts, Eagles, and Chiefs. The Packers were 3rd in most pass attempts. I think the Packers will come close to 100 more rushing attempts this year than last year. That amount would still put the Packers just outside the top 10 teams in rushing attempts from this year. AND…. Cobb is gone to the Cowboys. Good riddance. Matthews to the Rams. Guess he didn’t want to stick around and play inside linebacker. That, or he realizes LA has a much better shot at a Super Bowl and he doesn’t have to put up with six months of winter. Those are some pretty good reasons to bounce. I’m proud he was a Packer even though i thought he’d have a higher ceiling in the NFL (HOF). I’m still pissed off at him for going M I A in the Seattle game, but other than that, i wish him well. Hope they sign a TE from Iowa to take one of the receivers spots. They will need a TE because Graham only will last another year.